Location: River Dee, Aberdeenshire, Scotland. Condition: Intact. In use as a residence. Ownership / Access: Private. Not open to the public, but serves as a venue for meetings, private dining, marquee events and weddings. 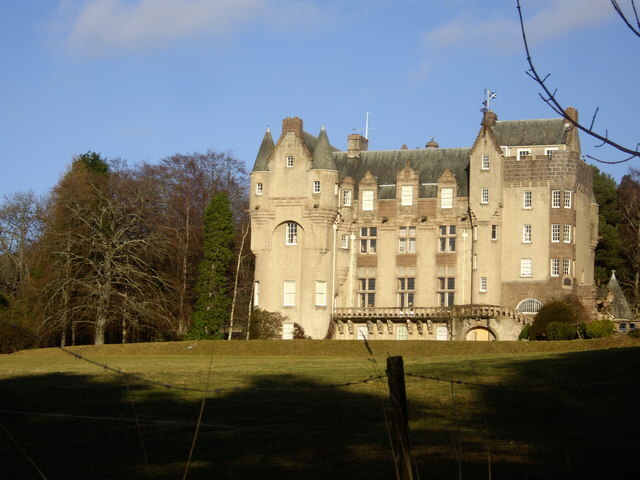 Notes: Kincardine Castle is a Victorian country house in Royal Deeside, Scotland. It is 1 kilometre (0.62 mi) north-east of the village of Kincardine O'Neil, and 8 kilometres (5.0 mi) east of Aboyne on the north side of the River Dee, Aberdeenshire. The castle was built in 1894-6 to Scots Baronial designs by Niven and Wigglesworth of London. The architects were influenced by the Arts and Crafts movement and this shows in the design. It is a category B listed building. The house was built on the site of, and incorporating part of, an earlier building called Kincardine Lodge, dating from around 1780.T. H. Mawson prepared plans for the gardens around 1900, though it is not clear if they were carried out. At the heart of a 3,000 acre (1,200 ha) estate, the castle is not open to the public, but serves as a venue for meetings, private dining, marquee events and weddings. There are extensive gardens which are open for one day in June under the Scotland's Gardens scheme.